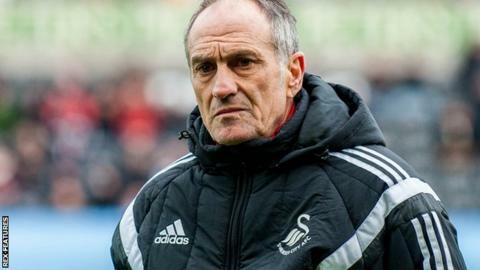 Swansea City head coach Francesco Guidolin has been released from hospital after recovering from a chest infection and is set to return to work this week. Guidolin, 60, was taken to hospital hours before Swansea's 2-1 win at Arsenal last Wednesday. The Italian also missed the 1-0 win over Norwich, with Alan Curtis in charge for the second successive game. "Francesco Guidolin has been released from hospital after making a good recovery and will resume duties this week," Swansea City tweeted. Swansea, who are nine points clear of the Premier League's relegation zone, are away to Bournemouth on Saturday.